The first part of the retreading process is to inspect the tyre to see whether it meets with our stringent quality specifications. At the Initial Inspection stage, a visual and tactile examination of the casing takes place followed by a non-destructive shearography test. This test detects any inherent separations within the casing which are impossible to detect with the naked eye. The buffing process removes the remaining tread and sidewall rubber from the casing to the exact specified dimensions by means of high-speed revolving rasps and brushes. Using computer-controlled machinery, the operator is able to achieve the exact dimensions required so that the buffed casing is the exact profile for its intended matrix. 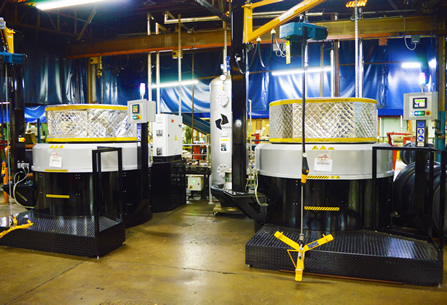 The granular residue produced during the Buffing process is extracted using high-powered fans and collected in large hoppers ready for recycling. Firstly the buffed casing undergoes a further visual inspection with an experienced eye. Any visible cuts or exposed cords are “buzzed” out by hand to establish the degree of damage not visible during the initial casing inspection. Only when satisfied with the casing does the technician sign it off and forward it on to the next process of checking for penetrations within the tubeless liner, which forms the inner wall of the casing. In order to locate any minute holes within the inner wall, the casing is subjected to a penetration detection process which involves high voltage electricity being passed through the tyre whilst it is rotated. Should a minute hole be detected, an arc is produced which stops the machine and alerts the operator to the location of the penetration for the repair to be made. special compound ready for the Building process. During the Building process, new tread material is applied, or stitched, to the casing using a patented computer-controlled process. A continuous strip of premium rubber compound is wrapped around the tyre whilst it revolves on an inflatable chuck. 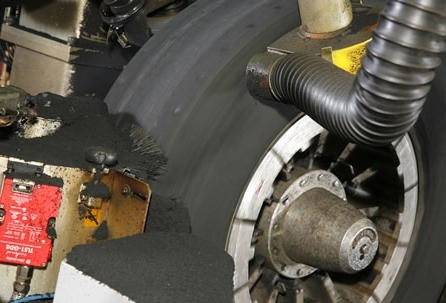 The whole process is computer-controlled to ensure that the correct amount of rubber is applied. This is important to ensure that the tyre is built to the exact specified dimensions required for its particular matrix. 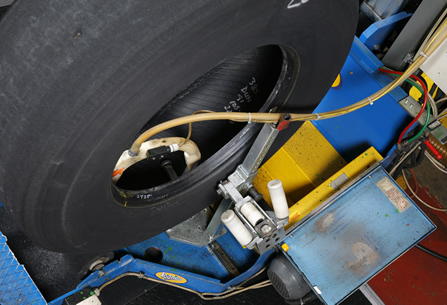 The use of a continuous strip ensures that the tyre is perfectly balanced for service. 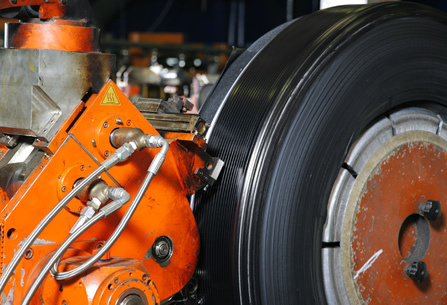 The curing process sees the ‘built’ tyre placed into a hot, segmented radial matrix within a curing press. 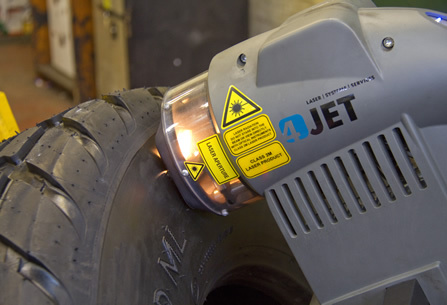 The tyre is heated for up to 95 minutes at 155°C, whilst inflated to a maximum of 300psi, with the use of an internal bladder placed within the casing. The combination of heat, time and pressure ensures that the new rubber is correctly vulcanised, resulting in a tyre with the same tread pattern and depth as the matrix specification for which it was intended. 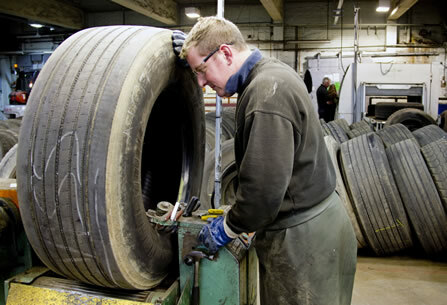 This is the same process as is used in the production of new tyres. The first examination is a visual and tactile inspection, where a trained eye will spot any imperfections within the tread pattern or sidewall. The second examination sees the tyre go through an inflation test, where it is rapidly inflated to 150psi. Any structural imperfections or weaknesses will be clearly exposed.